This week in the war, in the early hours of 19 August 1942, Allied troops raided the port of Dieppe in German-occupied France. The raiding force included British and Americans but was overwhelming Canadian. Before the morning was over, the troops who had not been killed or captured were withdrawn. Of the 5,000 Canadian taking part, about one fifth were killed and over one third were taken prisoner. Planning was overseen by Vice-Admiral Mountbatten, Chief of Combined Operations. After the disaster, lack of secrecy, lack of supporting naval firepower, and lack of air support were cited as reasons for the failure. 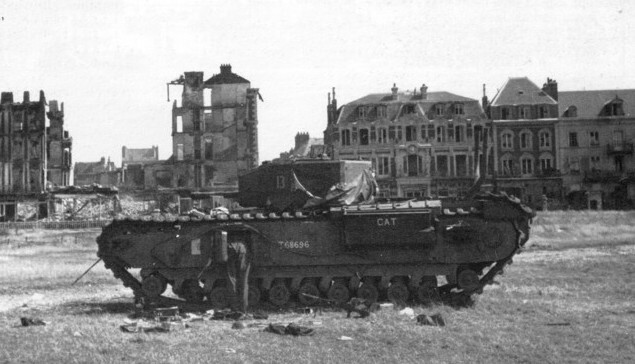 A Canadian armoured regiment took part in the operation but the tanks failed to get off the beach. Pressure from Stalin to mount a ‘Second Front’ is sometimes cited as a reason for the raid. The lessons learned at Dieppe were later put to use in planning the much larger amphibious landings in North Africa (Operation Torch) and Normandy (Operation Overlord). This entry was posted in World War II and tagged Dieppe, Mountbatten. Bookmark the permalink.